The desert land of Rajasthan comes alive when professional artists take the center stage. They leave the spectators spell bound with their mesmerizing Dance and Music performances. No celebration is complete without swaying to the rhythms of the folk music. Be it the advent of monsoon or the festivals and fairs of the state, Rajasthan has a dance for every occasion. The women sing melodious songs while carrying out their household chores. Rajasthan is famous for its special entertainment communities whose profession is to entertain people with their dance and music performances depicting stories of romance and chivalry. They keep shuttling from place to place to flaunt their talent. The Rajput families would invite these entertainment communities to perform at their celebrations. The erstwhile Maharajas were patrons of dance and music and hence their kingdoms had great artists. Maharajas used to support the entertainers in every way. Ghoomar: It is the most popular dance of the state. The tourists admire it very much. The women flaunt their skills of taking rounds at a very high speed while the music is being played. Their Ghagras (long skirts) spread out while dancing. They simply look graceful. It involves a lot of energy and enthusiasm. And the astonishing thing is that the faces of these women performers remain covered by the veil while performing. According to the tradition of Rajasthan the new bride is expected to perform Ghoomar dance when she comes to her husband's place for the first time. Fire Dance: As the name suggests this dance form involves the use of fire as a prop in the dance. A large bed of flaming coals is set for the performer to walk on coals. And the astonishing thing is that the performers do no get any blisters on their feet after the performance. May be they are blessed with God's grace! Actually it is because of the swift movements of the dance. Drum Dance: This dance is performed by people belonging to the Martial race. The dancer holds a naked sword in his mouth and juggles three other swords with his hands without causing any injury to himself. This awe inspiring performance is coupled with the beat of drums. Kachhi Ghodi: This is an interesting dance performance packed with laughter. It is performed in a bridegroom's party. The performers decorate themselves in special costumes and it seems as if they are riding dummy horses. The dance touches the theme of chivalry. Kathak: It is a pure classical form of dance. Kathputli (puppet) Dance: The puppet dance of Rajasthan is famous all over the world. This dance form is high on entertainment quotient. The puppets are strung on the stage and the tales steeped in the royal history are told through dance. Chari: The women performers dance while balancing 7-8 brass pots on their head. Sapera Dance: This dance form is performed by the Snake charmers. A great deal of expertise is involved in it. They wear long black ghagras (long skirts) embellished with silver ribbons. They spin in circles at a very high speed as of they are made of rubber and not flesh. 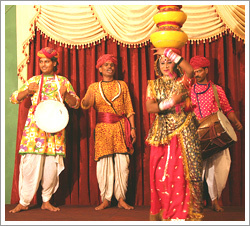 Bhavai: This dance involves flipping of earthen pots on the beats of the musical instruments. The musical instruments used in this dance form are Ravanhatha (a stringed instrument), the Morchang (a Jewish harp), the Bankia (trumpet) and the Algoza (twin flutes). Raas Dance: This dance form is dedicated to Lord Krishna. Holding sheer philosophical meaning, the dance depicts scenes from the life of the divine. Gangaur Dance: This dance is performed during the celebration of the famous Gangaur festival when womenfolk worship goddess Gauri for long life of their husbands. They perform while balancing a pot filled with green leaves, flowers and grass on their heads. The music of Rajasthan touches several themes like love, war and devotion. The musicians can be broadly categorized into two traditional classes: the Langas targeting the Muslim audiences and the Manganiars who do not have any particular target audience. Some of the musical instruments used in the Rajasthani music are the Morchang, Naad, Sarangi, Kamayacha, Rawanhattha, Algoza, Khartal, Poongi, Bankia, and Daf. The list is endless as each region has its own special instruments.